Donald Trump’s sudden decision to withdraw American troops from northern Syria in December 2018 hit Turkish, Kurdish and international media headlines and continues to dominate the public and political agenda due to the ongoing threat of the Islamic State (IS), continuing Iranian activities against Israel and the threat of a Turkish crackdown on the Kurds. Influential American political figures and anti-IS coalition partners criticised Trump’s decision, arguing that the fight had not yet been won and the region would be exposed to the risk of further bloodshed in the absence of US forces. The Kurds too reacted with astonishment, concluding that they had once again been betrayed by a great power. Their fate is in doubt once more, this time because they are exposed to the threatening of Turkish President Recep Tayyip Erdoğan, who has made clear that Turkey’s armed forces stand ready to launch an attack at any time without warning. He continues to threaten to invade the comparatively stable region Kurdish forces have declared the ‘Democratic Federation of Northern Syria’, and the Kurds have taken these threats seriously, repeatedly appealing to the international community regarding the hostile intentions of the Turkish state. This concern stems from their prior experience of repression within Turkey as well as in Iraq and Syria. The Turkish government claims that the Kurdish groups that oppose it are not representative, and instead recognises a delegation it has appointed as the legitimate representatives of the Kurdish cause. This evokes memories of the situation after the First World War, where the victorious powers sealed the Kurds’ fate, leaving them stateless and vulnerable to political persecution and human rights abuses from that point onwards. Under the Erdoğan government, the Turkish state aspires to convince the international community into branding the Kurds terrorists, who must be defeated. The anti-Kurdish campaigns of the Turkish government follow from the historical approach of the Turkish state toward the Kurds by rejecting any political and cultural inclusion of the Kurdish minority into modern Turkey, and withdrawing any special protection from them. The Kurds – in any shape or form – are a thorn in the side of the Turkish government. All Kurdish groups outside of Ankara’s control are considered by the government to be ‘terrorists’, unrepresentative of the country’s Kurdish minority, with the Turkish state seeing its duty as to control the Kurds against their will. To eliminate any form of collective representation, the Turkish government deploys the ideological discourse of terrorism to demonise Kurdish groups. Terrorism – which generally lacks a theoretical or conceptual definition – and the efforts to fight it, are used by Erdoğan as ideological weapons, with their discursive meaning utilised to justify and legitimise his undemocratic, repressive and hostile policies, consolidate his structural power, and delegitimise the demands of Turkey’s citizens for democratic reform. By using the notion of terrorism, he undermines Kurdish voices and effectively silences Kurdish demands for democratic rights, instead pursuing Turkey’s own national and regional interests. The Turkish government under the AKP follows an Islamic-nationalistic agenda and strategies that promote territorial expansion and a revival of the Ottoman spirit in the form of Neo-Ottomanism, assuming the mantle of the leadership of the Muslim world through the reconstruction of Muslim identity, considered an integral element of ‘Turkishness’. Erdoğan’s statements questioning the Lausanne Treaty are an attempt to redraw the map and reshape the Middle East in his favour, and to this end he is not interested in a sustainable peaceful solution in Syria in particular, or the Middle East in in general. Instead, the Turkish state sees the Kurds as an intolerable threat to its policies of territorial expansion and its politicised, Turkified form of Islam, with the concomitant vision of Islamic Turkishness. Consequently, Kurds in Turkey, Iraq and Syria have constantly faced xenophobic, repressive and discriminatory treatment at the hands of Turkish nationalists. The Turkish establishment fears a distinct Kurdish ethnicity and corresponding ‘national’ characteristics, as well as the radical secular model of grassroots democracy introduced by the Kurds in northern Syria, given that this runs counter to the Turkish narrative and Turkey’s strategic vision. Its proponents are therefore perceived as a threat. In contrast, Erdogan has compared the various Islamist groups fighting under the ‘Free Syrian Army’ umbrella to the Kuvayi Milliye, Ottoman-era Turkish nationalist irregulars. The Turkish presence in northern Syria can hardly be said to be related to the fight against any sort of ethnic and religious fundamentalism or against IS, which has been almost defeated militarily by a Kurdish and Arab alliance named the Syrian Democratic Forces (SDF) in cooperation with the international coalition against IS, now completely driven from Northern Syria. IS and other dormant Islamist factions, though of concern to the international community, worry the Turkish government much less. In fact, the Turks have turned a blind eye to the global flow of radical Islamists across the Turkish border into Syria, and have even provided weapons to these elements, as revealed in a leaked audio recording of conversations between senior Turkish officers in 2014. It is incumbent upon the international community to support the Kurds in this situation, not only due to the legal and moral responsibility it has regarding the many Kurdish lives given in the continuing battle against IS, but also in terms of ending further instability, providing secure detention for the foreign fighters in Kurdish prisons, and eradicating new sources of terrorism, which naturally includes religious fundamentalism. For example, many of the foreign IS detainees, seen as a ‘time bomb’ from a Western perspective, are in Kurdish prisons in Northern Syria. A leader of the autonomous region, Ilham Ahmed, reiterated that they had no intention of releasing these Western IS fighters, but warned that in the event of a Turkish assault on the region, these prisoners might escape from detention while the Kurds focus on defending against the existential threat of twin assaults by the Turkish army and pro-Turkish jihadists. Therefore, action must be taken to prevent a Turkish assault on the Kurds administering relatively stable Northern Syria. The Kurds have committed to ensuring the continuous safe detention of their IS prisoners, and stand ready to, with the help of the international community, put the prisoners on trial for their crimes against humanity, as well as to contribute to the rehabilitation of their families. The Kurdish groups fighting under the banner of the SDF have, according to US military officers, proved themselves reliable and effective ground forces in the battle against IS. 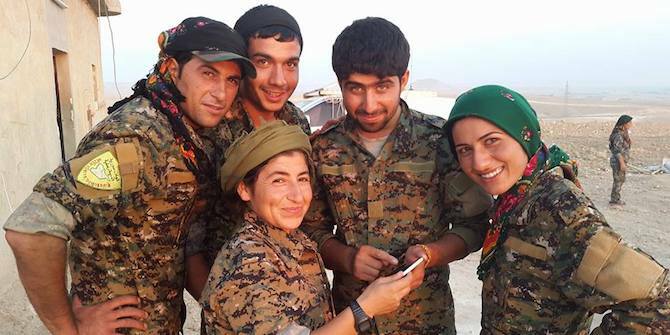 Furthermore, the autonomous Kurdish structures act as bulwarks against jihadist ideology, given their secular character and promotion of gender equality, with few other regional actors (except perhaps Israel) willing to fight in defence of these values. Consequently, the Kurdish model could function as a vehicle for the military and cultural protection of secular and feminist values opposing a resurgent ‘jihadist nihilism’ that remains at the heart of the Middle East’s current quagmire. Veysi Dag is a research fellow at SOAS, University of London. His research interests include migration and diaspora studies, with a focus on stateless diasporas, diaspora (counter)-governmentality, comparative politics and refugee and migration policies in Europe, citizenship studies, transnationalism, social movements, the Kurdish–Turkish conflict, peace-building and conflict transformation and regional policy analysis, with a focus on Middle Eastern politics.